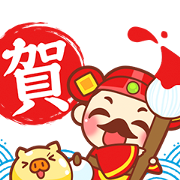 Best wishes in the Year of the Pig! May the Chinese God of Wealth come to wish you a good fortune. Friend Click108’s official account to get this set for free.